As policymakers head to Durban for another round of high-level sparring on emissions reduction, it is unlikely there will be much talk of yams or sorghum, or of soil acidity and tillage. Finding a way to meld the macro-level diplomacy of the Conference of the Parties summit with the practical, micro-level solutions needed to protect agricultural communities and their crops from the effects of climate change is, many experts say, crucial to translating consensus and goodwill into meaningful action. Farmers face new and extreme climatic conditions, and must adapt their practices and crops to allow for sudden, temporary shifts in weather patterns. This needs a focus on the crops themselves, experts say, and action in the near term to make sure that, whether mitigation efforts curtail the worst effects of anthropogenic climate change or not, there are plant varieties capable of withstanding the shifting weather. As Cary Fowler, executive director of the Global Crop Diversity Trust, says: "I don't think that people have begun to grapple with the enormity of the problem… agricultural crop adaptation really isn't even on the agenda. All our efforts at the macro-level are clearly going to fail as the crops die in the field." Mr. Fowler is the architect of the Svalbard Global Seed Vault, an underground facility on the Arctic island of Spitsbergen, funded by the Norwegian government. 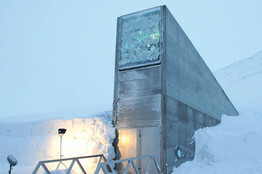 The vault is designed to house a gene bank, containing seed samples from around the world, to prevent the diversity of crop types from being lost. These different varieties could contain traits that will be critical to solving many of the challenging new conditions that farmers face. Breeding useful characteristics—such as drought or flood tolerance—into crops is an ancient science, but it takes time. Without sufficient focus on these micro-level issues, however, there is a danger, Mr. Fowler believes, that real crops in real fields don't get adapted. "I'm sorry to say but we're really going to have to get our hands dirty," he says. "This is getting us out of the realm of policy and big intergovernmental meetings, we're going to have to… figure out what it's going to take to help the crops adapt." The entire pipeline, from finding and indexing traits, to storing them, making them available to researchers and getting them into the breeding system needs to be developed. "I guess what we find alarming is the assumption that that's just going to happen by itself, without planning and without investment," Mr. Fowler says. "That doesn't happen overnight. It's a 10-year process." The 20th-century heralded the transformative effects of new varieties and is a century often hailed as an exemplar for development actors looking to boost Africa's agricultural output. The Green Revolution in South Asia in the 1970s, for example, was in part driven by a major investment in new, high-yielding varieties of rice, developed with funding from the Rockefeller Foundation—as well as through significant expenditure on infrastructure and fertilizers. Hailed in some quarters as a 21st-century iteration of the Rockefeller Foundation, the Bill and Melinda Gates Foundation is funding research into crop science innovations that could simultaneously improve productivity and protect against climatic shifts. Lawrence Kent, who heads the foundation's research and development program on agricultural development, says that he must first establish what crops are most important to people. "That leads us towards the staple crops, like maize and sorghum, cassava, rice, even some of the tubers and legumes. We try to focus our research on those crops," he says. The practical challenges are not dissimilar from the perennial question of how to improve food security in the developing world. There has always been a pipeline of improvements that could be made. What has changed today is the urgency with which that pipeline has to flow. "Now, because of climate change and the additional, accelerated levels of threats that are coming on the abiotic side—things like drought and flooding and higher levels of heat—it becomes even more important to accelerate the crop improvement process," Mr. Kent says. The Gates Foundation's programs have already led to innovations that may have profound affects. The Stress Tolerant Rice for Africa and South Asia, or Strasa project, which works on developing rice that can resist droughts, prolonged flooding and mineral contamination has been adopted by large numbers of farmers in India, and should be rolled out to Africa over the next few years. A program at the Centro Internacional de Mejoramiento de Maiz y Trigo in Mexico, has led to the development of more than 80 drought-tolerant varieties of maize, which could allow farmers to boost harvests by 30% in drought conditions. However, experts warn that time is short. Bruce Campbell, a veteran South African climate and agricultural expert who now heads the climate change, agriculture and food security program at the Consultative Group on International Agricultural Research, doubts that any one innovation will emerge. It will take hard graft and a lot of ground-level research. "If you think about African agricultural systems, they are so diverse that even a fantastic rice breakthrough is not going to do anything for the granite sands of Zimbabwe," he says. "I think there have to be lots of breakthroughs, but it's not going to be this big silver bullet that takes off everywhere." Even so, Mr. Campbell remains optimistic. "I think if you put all of [the developments] together, in two decades time we could be seeing an entirely different scenario in Africa, potentially."